noise and signal: Am I famous yet? 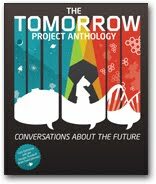 "Intel's Tomorrow Project draws on the work of writers such as Corey Doctorow, Sonia Orin Lyris and Charles Walbridge to create visions for the future that can inspire the public, and act as goals for engineers." Feelin' smug over here. Just a tad. Yeah. As for the anthology itself, the pdf is still available here, and still free. Congrats. That is awesome name placement. I haven't read much by Doctorow, but I've heard him talk on the ISBW podcast and I've read Little Brother. Plus I've seen all the bajillions of followers he has on Twitter. Definitely a good thing. Well, you can read this one without paying a copper-colored cent. (Ha ha.) Let me know what you think. Plus, if you say “Cory Doctorow, Sonia Orin Lyris” really fast, and emphasize the right syllables, it could turn into “cory DOCTORow SONIA ORIN LYRIS”.